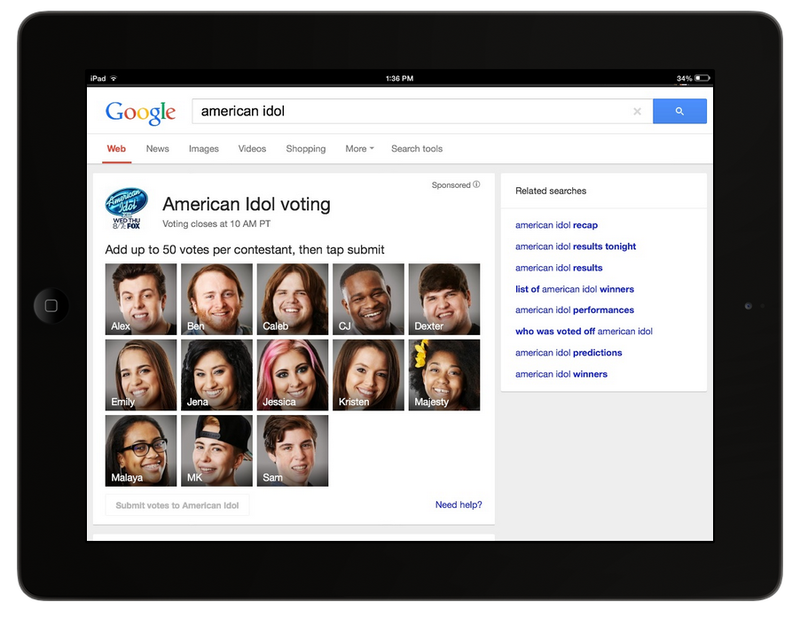 Just visit Google.com from or use the search app available on Android and iOS and search for American Idol or Idol. You will see a voting window with pictures and information of all the finalists. Select your favorites and submit your picks! You can vote to times for each contestant maximum. Google has used this pilot voting feature for the very first time and considering the reach of the search giant, this feature is set to receive a great response from the people. Very soon a similar style voting would be seen on other countries as well. How to Regularly Display Your Ads on the Top Positions in Google Adwords? Brands are always looking to increase their conversions and Adwords is a great platform to publicize your business. In order to receive more clicks on your ads and to increase your Clickthrough rate (CTR), it is important that your ad gets displayed in the top position in the first page of Google. Here are some metrics that will help you easily understand the logic that works behind for Google and lets it decide which ad to display in the top positions. Ad Rank determines the order in which the search results appear in Google. 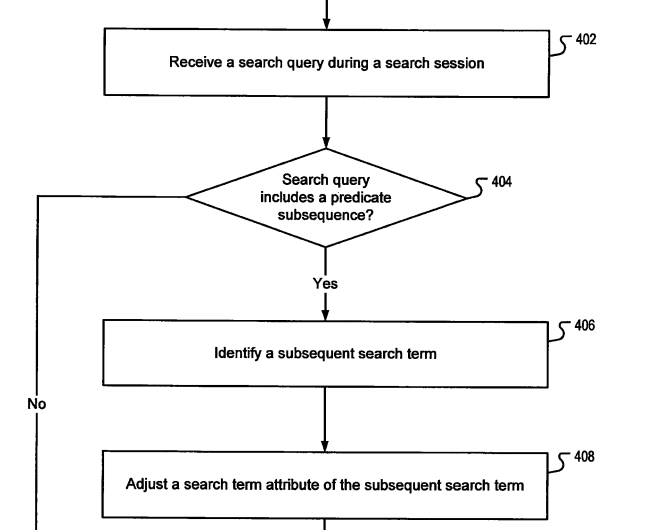 It is a combination of factors used in an algorithm which Google uses to fetch the most relevant ad from among thousands of ads competing for the ad space. Ad rank is directly related to improving the effectiveness of your adwords campaign. 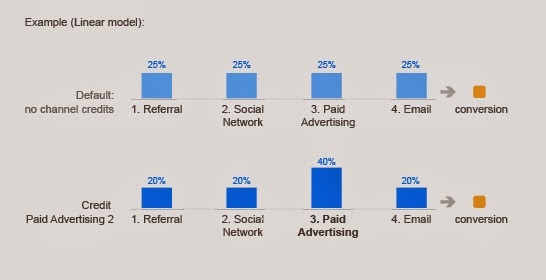 The image below displays the top factors affecting the ad rank. These are maximum cost per click, the ad quality score, the ad formats and the ad extensions. All these factors along with several other factors affect the ad rank of your individual ads present in the ad campaigns. Ad Rank actually depends on two important metrics namely the bid and the quality score. The bid is the amount that you are actually willing to pay when someone clicks on your ad and the quality score is an estimate of the relevance and usefulness of your ad when someone clicks on it. Quality score depends on the landing page and presence of keywords in the title or other important areas of your ad. These two metrics are explained in detail in the coming sections. Ad ranks are high for getting your ad displayed above the organic search results and a little low for displaying your ads besides the organic search results. Ads that are displayed above the search results receive higher clicks and greater conversions. To receive above the search result placement for your ad you need to focus upon having the highest ad relevancy, excellent Clickthrough rate and performance over time along with close top page bid estimates. Now, let’s discuss the ad quality score and ad bidding. Metrics that identify the relevancy of your ad copy with respect to the search query entered by the user, the quality of the landing page along with other factors is known as the Ad quality score. This score is on a scale of 1 to 10 with 10 being the highest and 1 being the lowest. Google always wants to display the exact search results which fulfill the customers query and ad score just does that. Ads that answers or provides the user with exactly what he/she is looking for receive a high ad score. Ads having a high quality score continuously rank higher on the search results. Consider the example when any user is looking for “red roses”. The user would simply type “red roses” in the search box in order to find sites selling red roses. If your ad copy contains the words “red roses” in the ad title, there are chances that your ad will meet the exact query which the user is looking for provided the other metrics like ad description and site content favors the user’s query as well. If this type of situation happens, your ad quality score will increase, thereby increasing the ad positioning along with the CTR ultimately boosting the revenue. 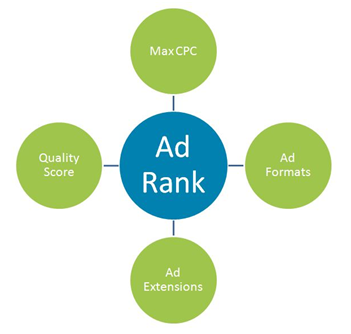 The figure below identifies the main factors affecting the quality score of your ad. The most important ones are the Clickthrough rate, the CPC bid, the ad relevancy, the keyword relevancy, the landing page optimization, the historical performance of the ad and other relevancy factors associated with your geographic target location and target devices. 1- Identify potential exact match keywords which the users will type while looking for your business and create ads specifically for them. 2- Use the main keywords in the title of your ad. 3- Provide a great user experience when the user clicks on your ad and reaches your main website. 4- Provide accurate information about your products and offers and do not mislead them. 5- Google only provides the most relevant ads to its users so think from a user point of view and make changes on your ad copy to make it completely relevant to what the user would be searching for. 6- Try and experiment your ad and check which ad copy is receiving the maximum Clickthrough or conversions, follow the pattern in creating similar ads with high quality score. 7- Identify keywords having a high quality score and identify the changes you did on the ad copy. Follow the same pattern for other ads. 8- Maintain the CTR of your display URL’s. 9- Target your ad in geographic locations most favorable to your business. Ads having successful geo location ad performance receive a high quality score. 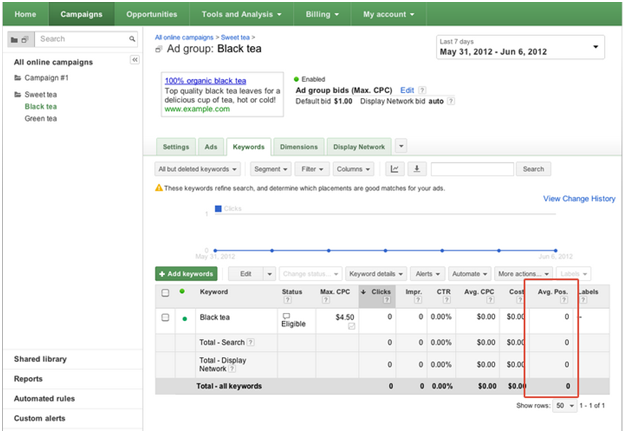 10- Check the performance of your ad in the display network and try to boost the CTR. 11- Ad quality score are different for different devices like mobile, tablets, desktops etc. Hence, prioritize the devices and keep an eye on the quality score your ad is receiving for the targeted devices. 12- Keep an eye on the historical performance of your ad campaigns. You ads are more likely to receive a high quality score if your ad campaigns have received excellent Clickthrough rates and conversions in the past. Also, if you are having a low quality score of your ad then you may need to bid a little more than usual in order to display your ads on the top position in Google which would result in a direct revenue loss. Hence, adwords ad quality score is extremely important to consider while preparing your ad campaigns. How to Check the Ad Quality Score? 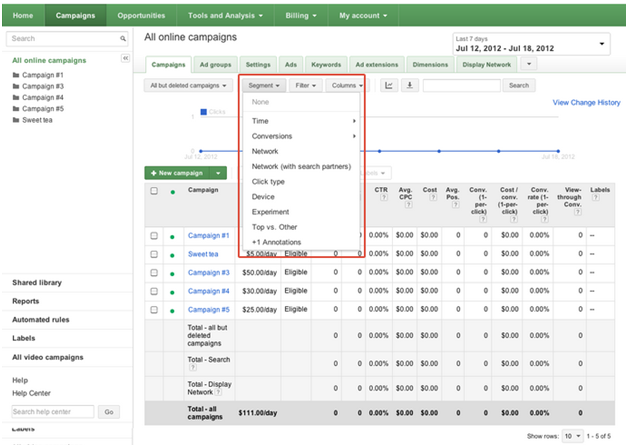 You can check the ad quality score of your ads by clicking on the campaigns tab then selecting the keywords tab. Here you will see the quality score in the top right hand side column as displayed in the screenshot given below. High quality score leads to better ad positions and lower bids. Constantly monitoring the ad quality score and maintaining it on a high score often leads to higher CTR and greater revenue. Bidding plays a vital role in the display of your ads in the search results. Google, by default displays the top position bid estimates after analyzing the total competition on the keywords you are targeting. Bidding close to estimated top page CPC enables your ad to receive more clicks easily by getting displayed in the top positions. How to View the Top Page Bid? 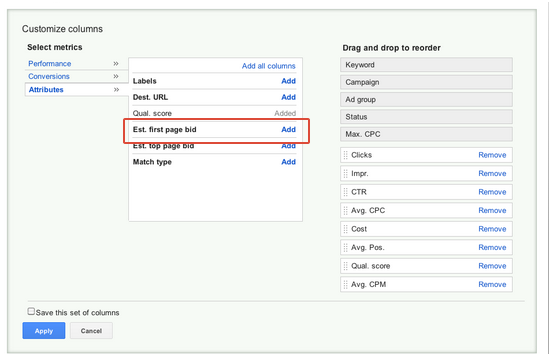 1- Click on the campaigns tab after logging in to your adwords account and then move to the keywords tab. 2- Click on the columns button and select customize columns. 3- Move to the attributes drop down menu and add estimated top page bid. This is the bid required for your ad to display regularly in the top positions. (Provided the other factors like ad relevancy and ad performance history favor your ad score). Setting up an intelligent bidding and constantly revising it as per the user behavior, competitor strategy and keyword trends all play an important role to strategically place your ad on the top position. It is important to mention here that quality score plays an important role in the est. top page bid that you will see in your campaign interface. A high quality score leads to low est. top page bid so always remember to keep an eye on that. Hence, in order to display your ad constantly on the top positions, you need a high Ad rank which depends on a competitive bid and high ad quality score. 1- Enhance your ad copy by making it more descriptive and catchy. This should be written both from marketing perspective and search engine perspective. 2- Include ad extensions like site links or call extensions. Google determines the performance of ad extensions while determining the ad rank. Hence, a good performance of your ad extensions can provide a high rank for your overall ad. 3- Keep your keyword list updated. Always focus on the most relevant keywords because relevancy is the single most important metric associated with your ad. 4- Make sure to regularly monitor your competitor ad’s copy enhancements if they are ranking on top and try to implement that in your ad. 5- If you are a seller of ecommerce products then opt for product listing ads which allows you to add individual product information in your ads. 6- Make use of “negative keywords” section in order to wipe out irrelevant keywords from your ad campaigns. This will help you to increase the Clickthrough rates of your ads by displaying your ads to people who are genuinely interested in buying your products or services. How to Determine the Position of Your Ad? 1- Click on the campaigns tab. 2- Determine your ad position by looking at the Avg. Pos column in the statistics table. This column displays the average position of your ad. Please see the screenshot below to better understand where you can find the average position column. In order to properly judge the performance of your ads over a specified time period or for a particular geographic area, you need to segment the performance data of your ad. 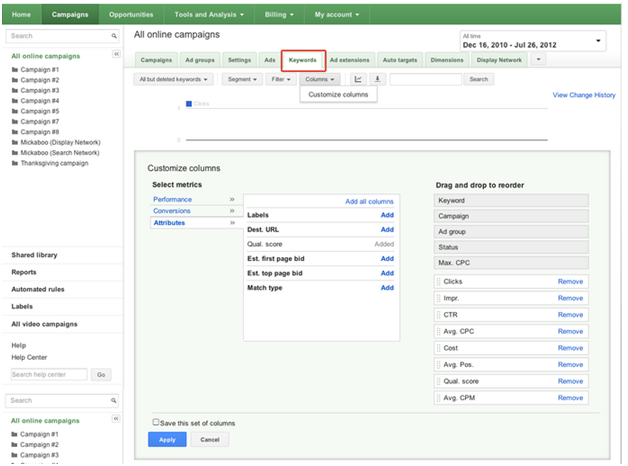 2- Click on the data range menu and select the time period where you want to determine your ad positioning. 3- Click on campaigns, ad groups or ads and move to the segment button displayed at the top. It is not always necessary that a high ad display position will boost your revenue. This is because higher ad positions costs more when compared to low ad positions so unless you are making considerably more profits on per click spending, you must not opt for high ad placements. Let the Experts Manage it for you! 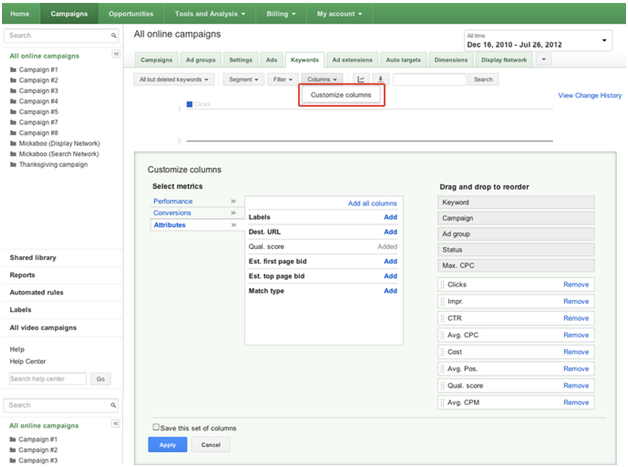 Managing adwords campaign is often tricky than it seems to be. Many times businesses spend more than what they should be spending and often end up incurring losses. It is for this reason; PPC management companies and Adwords certified professionals can be a great savior for successfully boosting the performance of your brand’s ad campaigns. Certified professionals constantly monitor the campaign performance and work towards improving the conversion rate of your ads. They can help you earn top ad positions by increasing the relevancy and quality score metrics associated with your campaigns. They are experienced enough to understand which works the best because they handle various accounts at a point of time and can easily monitor which combination works the best. Hence, it is always recommend letting your PPC campaigns be handled by professionals who are expert and certified directly from Google. The very concept of link building has changed in 2014. Infact, the term should now be referred as "link earning" because links build pass little to no value and links earned pass the maximum value. So, what should be an ideal strategy for link building in 2014 without letting Google penalize your site for bad link buulding or unnatural links. Links are votes that people give to your site after they start trusting it. Hence, links from high authority sites earned in a natural manner pass high value as compared to links earned from low quality ones. Google maintains a core ranking algorithm that ranks websites based on the number and quality of links it has. Any resource having natural high quality links ranks higher as opposed to a resource that is having fewer links or low quality links. Brand building is more essential than link building in 2014 and ahead. Google has started giving more importance to brands as they closely relate with the users and there are less chances of spam. Users trust brands and this in return help Google to wipe out results that are less trusted by the users. Brand building is of extreme importance and having a solid presence on social sites like Google Plus, Facebook and Twitter will largely help any business. Many businesses maintain content on their site without planning for any link bait resources. An expert content planner always creates content keeping in mind the viral spread probability. A high viral spread probability means the chosen resource can serve as a good link bait. Read more: How to Use Link Baiting? PR personnels should have good terms with the business. Any new brand related NEWS should get covered thoroughly, broadly and vastly. The maximum coverage a brand receives, the better are the chances of increased reputation, trust and populaity. I am not talking about distribution of press releases but instead I am talking about getting links from sites where it's hard to get any brand covered. Some NEWS reporters cover only specific topics and ground breaking events. You first need to become worthy of getting your brand covered by them (focus on user and improve the quality of services that you provide) then maintain good relationships with the person who is covering the NEWS. This bonding can surely earn valuable citations and backlinks for the main site. Please note: Do not purchase links by paying reporters. Buying editorial links is a violation of Google's guidelines. In 2014, user is the "King". Prepare every strategy keeping user in the mind and not the search engines. Remember, search engines can update their guidelines any time leaving the webmaster in trouble but the user will remain loyal for years to come. Maintain good relationship with the users and earn their trust. Always think unique and feed the users demands with utmost sincerity and dedication. Search engines will start following your site. Read more: What is Engagement Rank? Participating in well known industry events related to your niche is a great way to increase the popularity and reach of the brand. Make it a habit of visiting the important, local, popular and not so popular events and grab as much user attention as you can for your brand. Approach the events with sponsorships and offers and keep the user engaged with your brand in some way or the other. 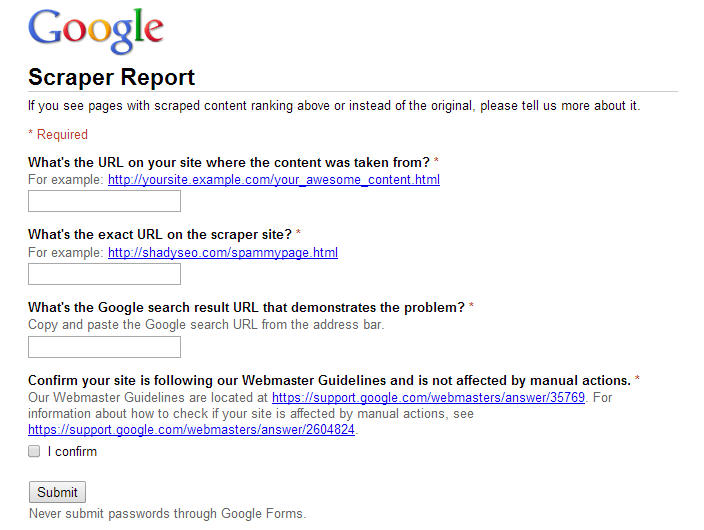 This will surely help your business in getting into good terms with the users and Google will make notice of this. Hence, keeping in mind the above strategies can surely help to build a Google friendly link earning strategy for 2014 and ahead. Please leave your comments and get the discussion started.